A Dream Cradle For Your Baby! This ten scalloped cradle boasts exquisite detail from top to bottom. 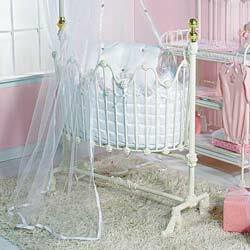 Elegantly styled Italian legs, tiny rosettes at the connecting joints, a gracefully scalloped top base, and a delicately scrolled valance rod add to the unique appeal of this beautiful iron cradle. Skilled craftsmen designing this piece uphold a tradition of commitment to quality, personal care and attention to detail.